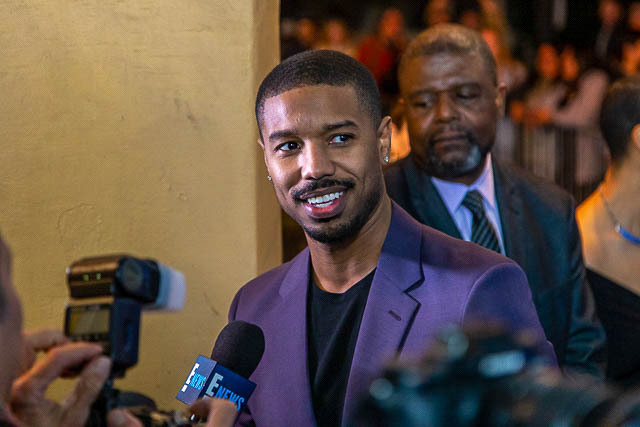 Michael B. Jordan has arrived at the Arlington Theatre in a black, sleek, luxury van at exactly 8:00pm. He remains inside the van for a long enough period of time to make the crowd begin biting their nails. 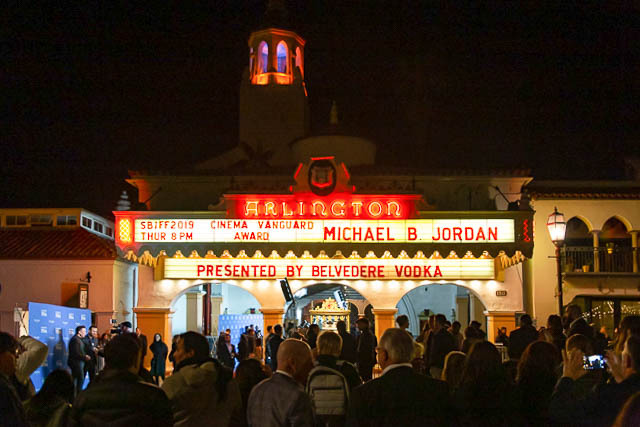 In anticipation of his appearance, his fans begin to chant his name and with an energy that feels like a thousand-person wave, Jordan steps into the crowd. “Michael, Michael, Michael,” is being chanted with gusto. “Be in my wedding?” a poster held by a super fan is bouncing up and down in an effort to gets Jordan’s attention. He autographs books, pictures, shirts and SBIFF special programs. He is strutting between the masses of people, protected only by a small hip-high railing. 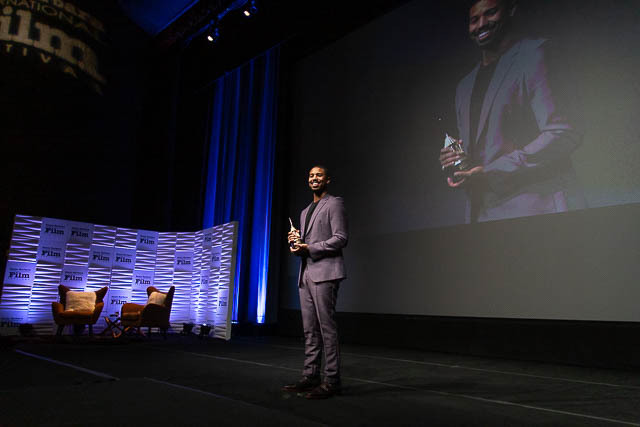 Durling is elated to honor Jordan with the notable Cinema Vanguard Award. 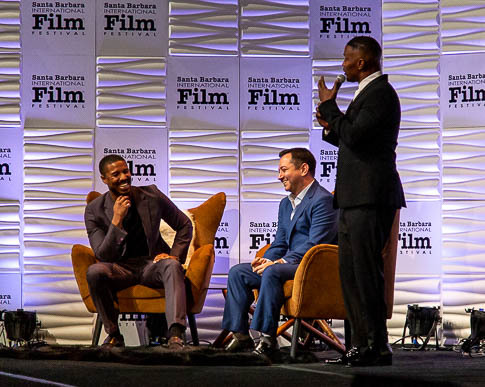 The award gives homage to actors who have “forged their own path, take artistic risks and make significant and unique contributions to film.” Jordan follows Michelle Williams, Martin Scorsese and Ryan Gosling, to name a few to receive the Cinema Vanguard Award through the SBIFF. Beginning his career at age fourteen, Jordan, now thirty-one, never had acting as an end goal to his hopes and dreams. 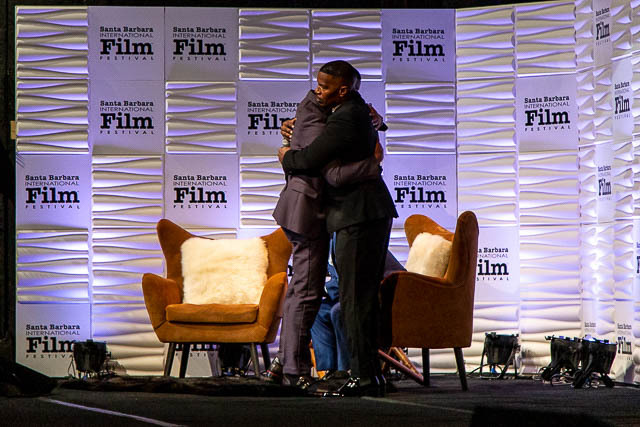 He began showing up for auditions as a child model and shares, “I was just paying my dues.” At nineteen, and after a few years acting on a soap opera, he decided to move to LA, “…to see if I have what it takes to become, I don’t know, just to be able to support myself!” Clearly directors and agents alike caught on to his natural-born talent. 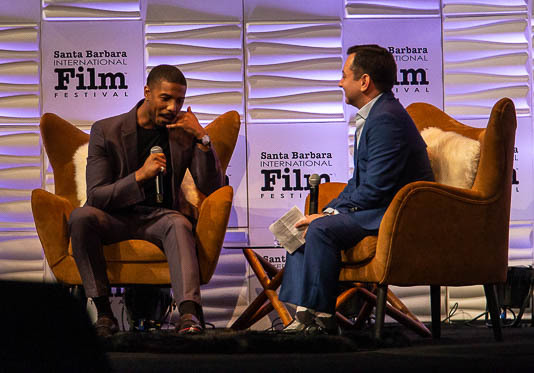 To date, his credits include Fruitvale Station, Creed, The Wire, Friday Night Lights and most recently, Black Panther. 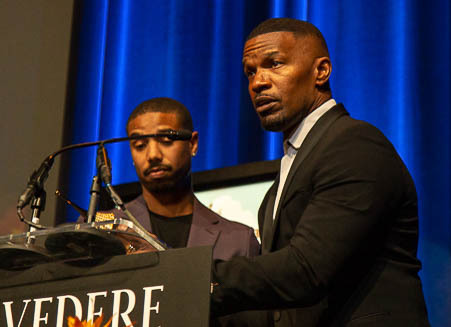 Being selective about the roles he chose as his acting became more developed, Jordan admits, “I wanted roles that didn’t have any bias on them.” He speaks honestly about the work ethic involved in acting in the many films he has accomplished alongside director Ryan Coogler. Jordan speaks about how he keeps uncovering new ways to see himself provide for himself and his family. 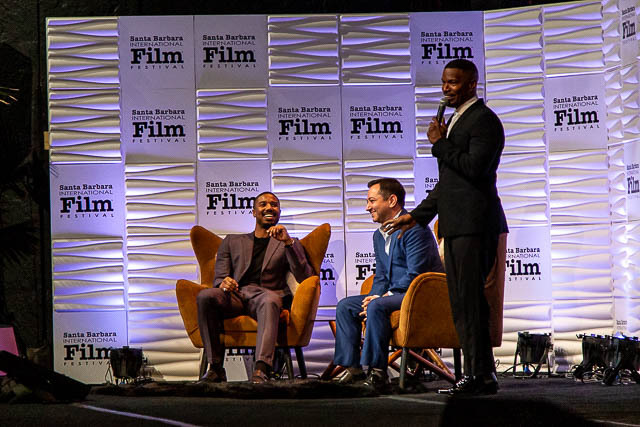 “I can’t hold my smile back,” Jordan shares when speaking about his imminent directing and production company opportunities. He has surprised even himself. 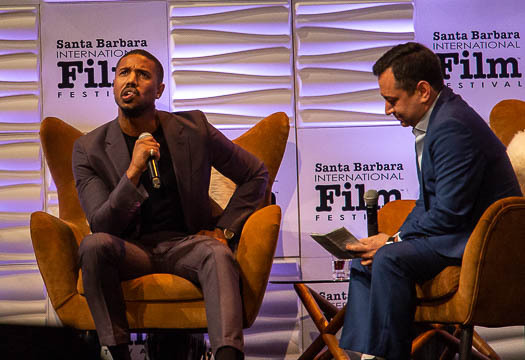 With Foxx beat-boxing, Jordan struts his stuff and the entire crowd is energized. Indeed, showing swagger is what Jordan does well. 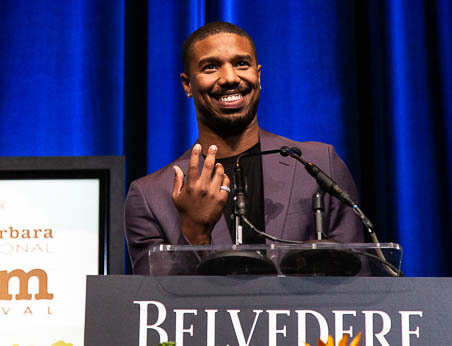 “He is breaking boundaries and stereotypes, not just in the box office, but in our homes and culture as well,” Foxx shares. 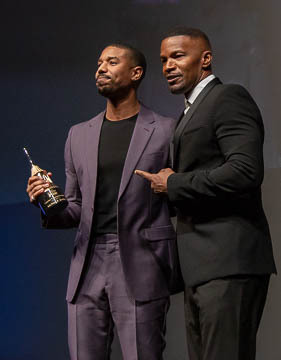 A shiny new award in hand, gifted to him with an embrace from Jaime Foxx, to be followed by his birthday the following day, Jordan is on point and bound for his best year yet.